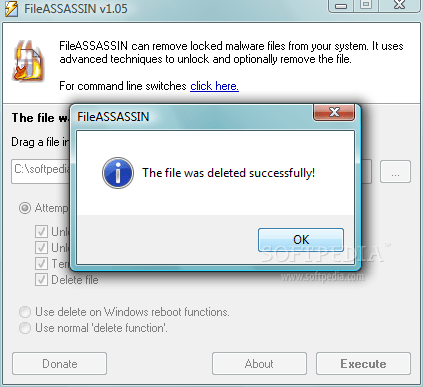 FileASSASSIN is an application that can delete any type of locked files that are on your computer. Whether the files are from a malware infection or just a particular file that will not delete – FileASSASSIN can remove it. The program uses advanced programming techniques to unload modules, close remote handles, and terminate processes to remove the particular locked file. Please use with caution as deleting critical system files may cause system errors. Simply download FileASSASSIN from one of the links below. If you selected the portable build, simply unzip and run the application, otherwise run the installer provided. Start FileASSASSIN and select a file by dragging it onto the text area or select it using the (…) button. Next, select a removal method from the list. Finally, click Execute and the removal process will commence.